This particular recipe for baba ghanoush (or baba ghannouj, moutabal, etc.) comes from a book called Little Foods of the Mediterranean: 500 Fabulous Recipes for Antipasti, Tapas, Hors d’Oeuvres, Meze, and More , but honestly, the basic recipe is pretty simple: eggplant, tahini, lemon, garlic. We served it with the gyros we made for the Almost Meatless Potluck. 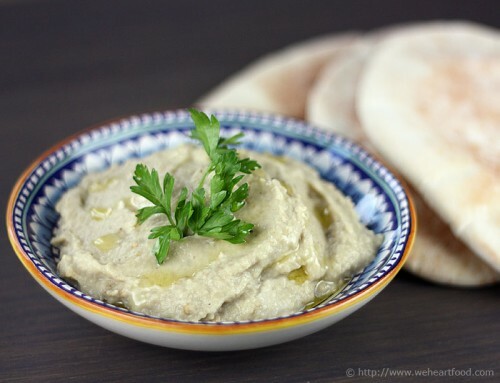 Hooray, I’ve always wanted to make baba ghanoush! I love the smokiness from the grilled and blackened eggplant. Yeah, this is good — tastes really close to how my dad makes it. Yep… though we always called it “moutabal” growing up. I think this one came out just a little … sweet? …is that possible? It might just need a pinch more salt. You’ll never get an argument from me on adding salt. To anything. Score the eggplants all over with a fork. Preheat a gas grill on high and grill the eggplant whole until the skins are black and blistered, about 40 minutes. Remove the skins and spoon out the insides as soon as you can handle the eggplant. Puree the pulp in a food processor, then drain the bitter liquid from the eggplant by letting it sit in a strainer over a bowl for an hour. In a small bowl, mix the lemon juice and tahini. Pound the garlic and salt together in a mortar until it is a paste, then stir into the tahini. Stir into the eggplant puree. Taste and add water to thin. Pour onto a serving platter and drizzle with olive oil, then top with parsley. Scoop with pita or Arabic flatbread. One thing we’re finding out about the recipes in Veganomicon: The Ultimate Vegan Cookbook is that a lot of them aren’t exactly weeknight-friendly. Some of them are very involved and one would be wise to steer clear if a quick dinner is the goal. This recipe definitely falls into the “takes a while” category, but is totally worth it. 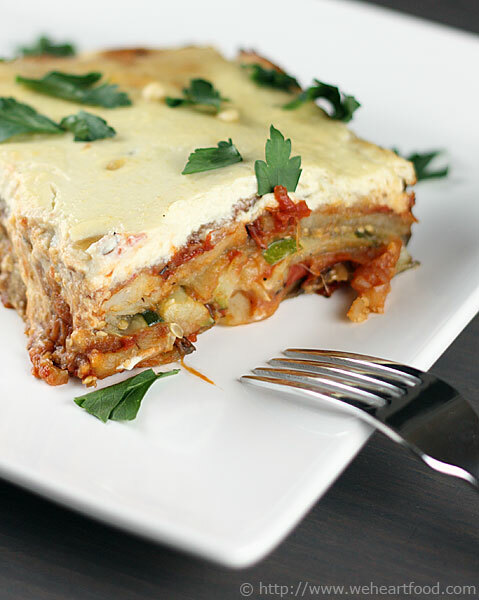 This moussaka (which I like to think of as a greek lasagna with eggplant standing in for the noodles) features layers of eggplant, zucchini, and potatoes, a nicely spiced tomato sauce, and is topped with a pine nut cream rather than bechamel (This is vegan, after all). Wow, that was kind of a pain, cutting those veggies 1/4″ thick. And it was a clear reminder that I need to sharpen our knives. Yeah, seemed like it took a while… if it makes you feel any better, the house smells absolutely amazing. Did you try the pine nut cream before you put it on? Yeah, it’s really, really good. Cool — I wasn’t sure about the whole pine-nuts-and-silken-tofu thing. You blend it to a really creamy consistency. I also tossed some pine nuts on top. Anyway, let’s dig in! I really like the potatoes in it — they were crispy and browned going in, and now they’ve soaked up the goodness from the sauce. I’ve never had a moussaka before, but you’re right, it is sorta like a lasagna. Wahoo, I’m ready for more — want to split another piece with me? You can always have more! I bet it’ll be even better tomorrow. Preheat the oven to 400˚F. Lightly oil two baking sheets, line a third with parchment paper, and spray with cooking oil. Wash the eggplant and zucchini, and trim the stems. Scrub and peel the potatoes. Slice the eggplant, zucchini, and potatoes lengthwise, into approximately 1/4″ thick slices. This is a pain, but worth it. Rub the eggplant slices with a little salt and set aside in a colander in the sink or in a big bowl for about 15 minutes to drain. Briefly rinse with cold water and pat dry with a paper towel. Place each vegetable on a separate baking sheet. 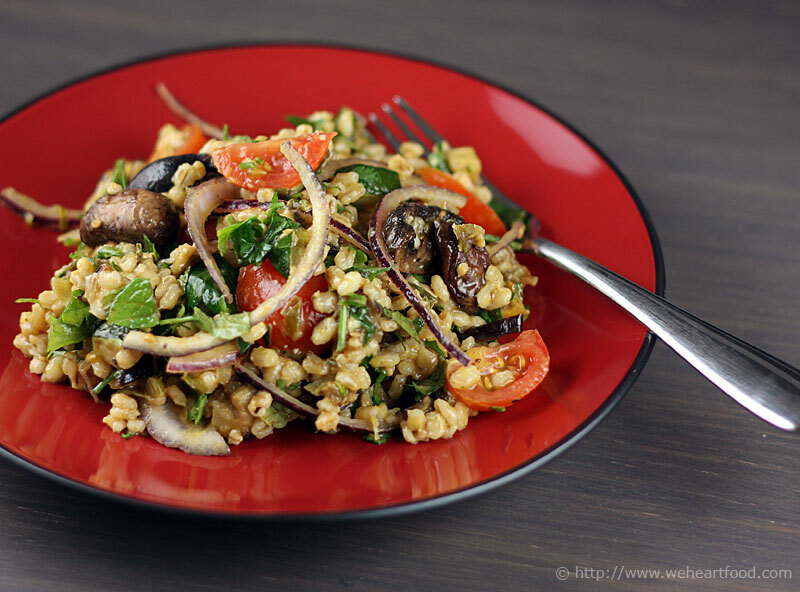 Distribute the 1/8 cup of oil among the three sheets and sprinkle vegetables with salt (except the eggplant if salted already). Toss to coat the vegetables on each sheet. Making sure each piece is completely coated with oil. Spread out the vegetables on each sheet; some overlapping is okay. Roast the pans of zucchini and eggplant for 15 minutes, or until tender. Roast the potatoes for about 20 to 22 minutes, until the edges are lightly browned. Allow the vegetables to cool. Combine the remaining 1/8 cup olive oil and minced garlic in a large heavy-bottomed saucepan. Heat over medium heat and let the garlic sizzle for about 30 seconds, then add the shallots and cook until soft and translucent, 3 to 4 minutes. Add the wine and simmer until slightly reduced, another 3 minutes. Add the crushed tomatoes, oregano, ground cinnamon, and bay leaf. Partially cover and simmer over medium-low heat for 12 to 14 minutes, stirring occasionally. Turn off the heat, remove the bay leaf, and adjust the salt. In a food processor, blend the pine nuts and lemon juice, scraping the sides of the bowl with a rubber spatula, until a creamy paste forms. Add the tofu, garlic, arrowroot, nutmeg, salt, and white pepper. Blend until creamy and smooth. Lightly oil a 9 x 13 inch pan and preheat the oven again to 400˚F, if necessary. Spread 1/4 cup of sauce on the pan, then add successive layers in order of eggplant, potatoes, sauce, and half of the bread crumbs. Spread all the zucchini on top of this. Top with a final layer each of eggplant, potatoes, sauce, and breadcrumbs. Use a rubber spatula to evenly spread the pine nut cream over the entire top layer. Scatter a few pine nuts on top, if desired. Bake for 35 to 40 minutes, until the top is lightly browned and a few cracks have formed in the topping. Allow to cool 10 minutes before slicing and serving. 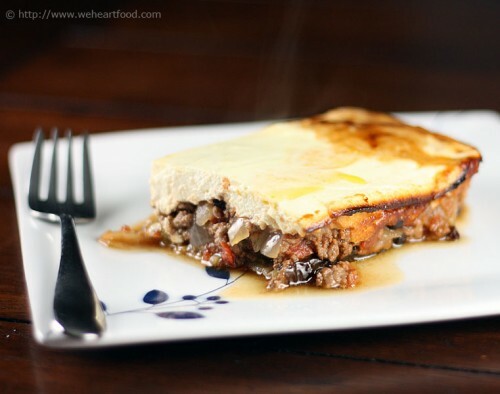 Vegetarian Week continues here at We [Heart] Food, with this recipe (okay, it uses chicken stock, but you could replace with vegetable stock) from Fitness Food . Nothing too fancy here, just a huge plate of roasted vegetables over a bed of couscous and chickpeas. I know, this is like your dream dinner! It’s true! It’s like a really good version of what I make at lunch at work. Super simple, and you can do it in stages… while the first set of veggies is in the oven you can start cutting up the next set. It reminds me of that dish I made for a party a few months ago. Oh yeah! I was just about to say this would be easy to bring to a party as a side dish. Tonight it works pretty well as dinner. Preheat the oven to 350F. Line two baking sheets with parchment paper and place the sweet potato and eggplant on the trays. Spray with the oil, add the rosemary, and toss to coat. Arrange in a single layer and bake for 15 minutes. Add in the zucchini, red bell pepper, and onion. Spray again with the oil spray and continue to bake an additional 15 minutes. Add the tomato wedges, drizzle with the vinegar, and bake for a final 15 minutes, or until all of the vegetables are tender. Meanwhile, heat the stock in a saucepan to boiling. Remove from the heat and stir in the couscous. Cover and set aside for 3 minutes, then return to a low heat and fluff with a fork for 2-3 minutes to separate. Add the chickpeas and most of the herbs. 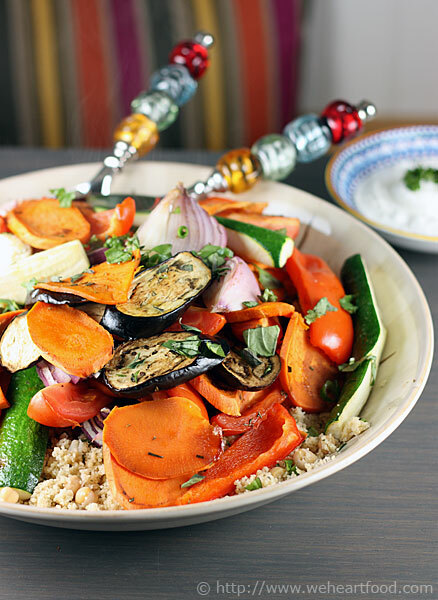 Serve the vegetables on warm couscous. Garnish with extra herbs.